Butcher-block countertops turn a pedestrian kitchen into a cook's paradise with miles of warm wood for food prep and eye-appeal. Wood is a timeless look that works with traditional, country, rustic and contemporary kitchens. It looks as much at home in a converted loft as it does in a country village Queen Anne. If you have tile, linoleum or stone floors, wood balances the look of quarry or kiln with classic natural texture. Scratch, nick, scorch or stain a butcher block countertop, and you can simply sand the damage away and reapply a protective coating of mineral oil. 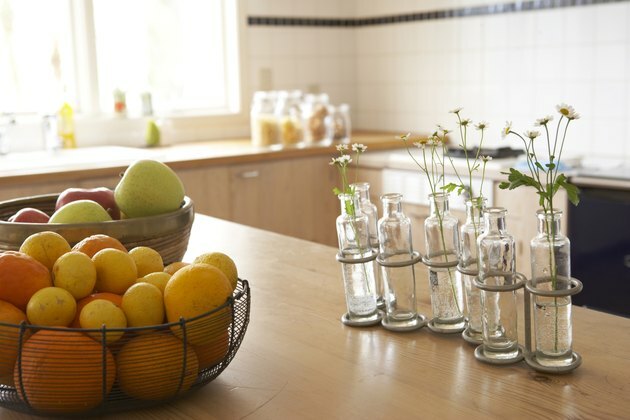 Wood surfaces hold up well against things like citrus that sometimes damage stone surfaces. They require no special process for cleaning, so you can wipe them down with plain soap and water. It's a good idea to protect wood surfaces by using a cutting board unless you love the look of a worn-away chef's table. Butcher block adapts well to your kitchen decor style. The wood complements just about any design, whether period or modern. Plus, you can find wood that works with your space by choosing a different species, color or finish. Wood tones are warm and welcoming, and wood is warmer than other counter surfaces, a happy bonus on a chilly winter morning. Wood surfaces cut down on the banging and clashing that happens in the kitchen. That means you can enjoy a quieter kitchen space, even when you're whipping up your latest culinary creation. Wood is softer than stone, steel or tile. If you drop something breakable on it, the item has a much better chance of survival. Butcher block surfaces don't dull your fine knives as quickly as granite or marble counters. Butcher block requires a little work to last. You need to seal butcher block properly to prevent staining. The wood is porous enough to harbor germs without a protective seal. Because it absorbs liquid readily, standing water on butcher block is a potential disaster. Water can loosen the glue that holds the wood together, split seams and grow some serious mold. Occasional applications of mineral oil and infrequent but regular refinishing should prevent that. Refinishing butcher block that starts to wear involves sanding off the old finish and any marks, then applying a new protective coating. But your counters will last a long time. Depending on use, you can expect to refinish them every 10 to 20 years. Butcher-block countertops are an investment, but so is any new counter in your kitchen. The two main choices of wood style are end grain and edge grain. End grain counters are more expensive, but they disguise wear best and are toughest. They are made with the ends of the boards glued together so the long grain of the wood runs perpendicular to the surface of the counter. Edge grain uses the long boards glued together, so their side edges form the counter surface. Edge grain shows knife marks more easily. The cost of butcher block can run from about $50 to $100 per square foot, depending on grain, wood quality, your location and customization. The good news is, you can install wood yourself. Unlike stone, wood can be trimmed to fit your sink and your counter space with tools you likely already have at home.